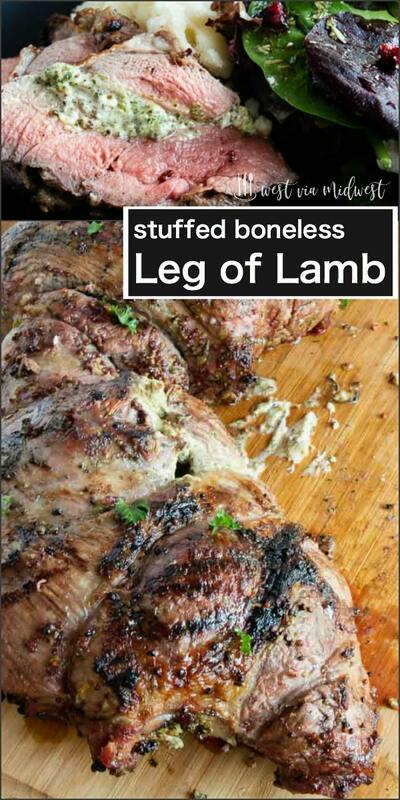 This No fail Stuffed Grilled Leg of lamb recipe is ideal for easy holiday entertaining! Simply seasoned with herbs and spices and stuffed with goat cheese this boneless lamb is the definition of a gourmet dinner. 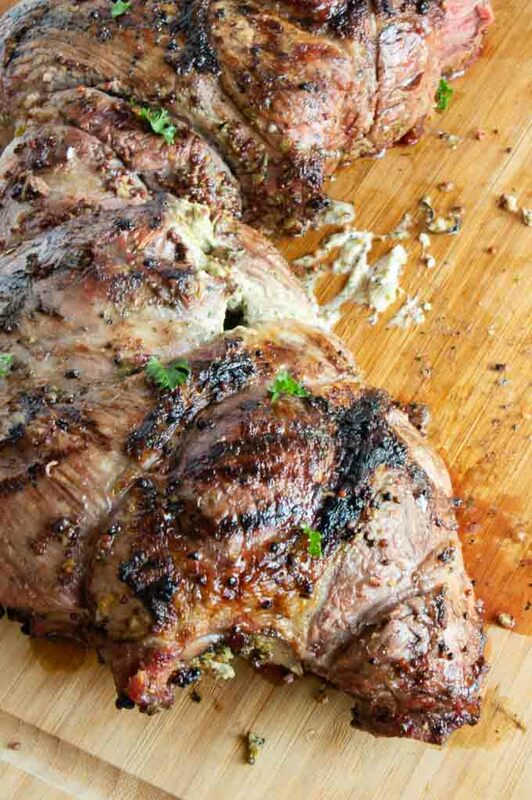 Today’s recipe for Boneless leg of lamb is a recipe that your guests will think you have some serious gourmet cooking skills but it will be our little secret how easy the grilled lamb is to pull off! 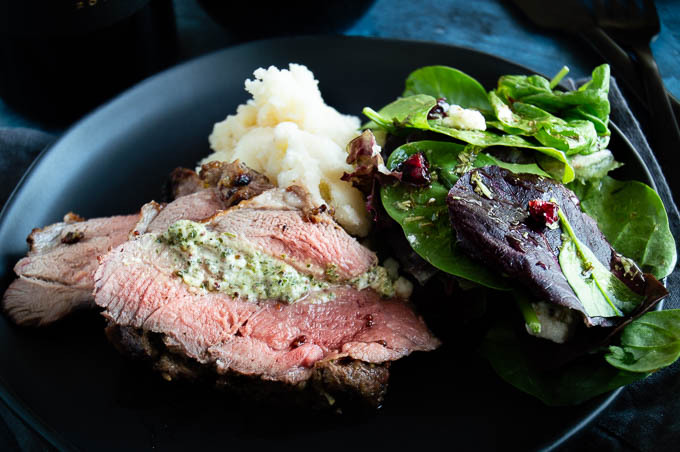 The meat is subtly scented with herbs and spices on the outside then as you cut into the tender, juicy meat there is a tangy creamy flavorful goat cheese in the center! It’s ideal for special occasion entertaining, but easy enough to pull off you can make it for a dinner party whenever you’d like! I love lamb. I have many recipes for it on my site like this grilled lamb chop recipe or this Irish Lamb stew. I know that most people find it intimidating but I am here to tell you that its very easy to cook and you needn’t worry when deciding to give it a try. Lamb is very versatile and today I’ll share many tips for making it successfully and I’ll answer all the questions that come with making lamb. 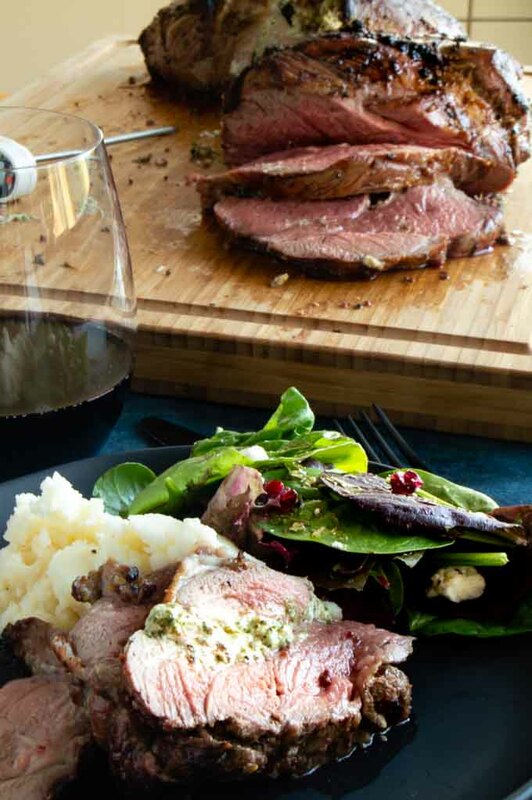 What to look for when buying a leg of lamb? Why you should butterfly a leg of lamb? What temperature to cook a leg of lamb to? How long to cook a leg of lamb? How to select Leg of Lamb? Leg of lamb generally comes as the shank end or the sirloin end. The shank end is a larger bone and the sirloin end usually has a lot more meat on it. The sirloin end tends to be a little fattier and more tender. In this recipe I suggest grilling or roasting so the sirloin end of the leg of lamb works better since it cooks more quickly. The shank end works if you are planning on braising it. Braising is ideal for a tougher cut of meat to have all the juices and time to really break down and become fork tender lamb. I tend to buy boneless leg of lamb for the sole reason that its easier to cook. When you buy boneless lamb you can butterfly it to cook it. Why do you want to butterfly leg of lamb? Lamb tends to be odd shaped which can wreck havoc when cooking it. Thicker in some areas and thinner in others. Nobody wants a cut of meat that is dried out on one bite and juicy and rare in another. If you butterfly it you can make sure the lamb is an even thickness everywhere for cooking. 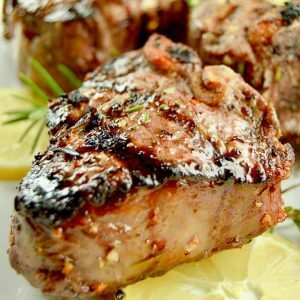 Another added bonus when you butterfly lamb is that you can season more areas for full flavor as well as be able to trim away any excess areas of fat on the lamb. 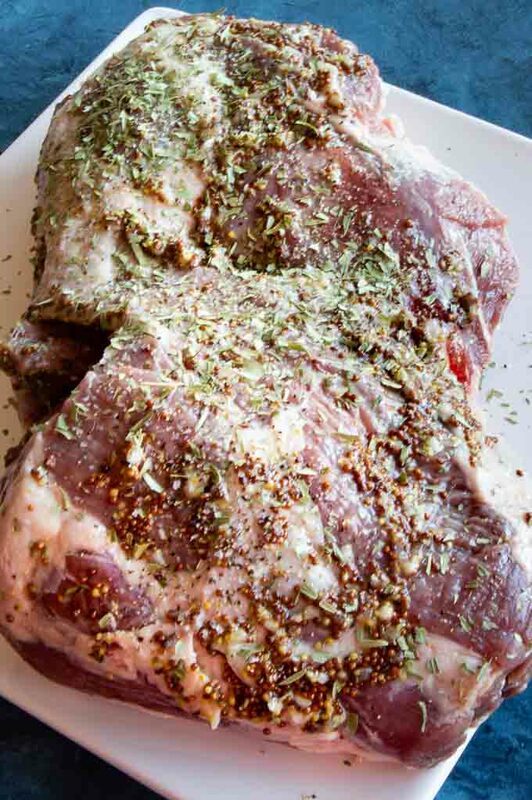 How to prepare leg of lamb for cooking? When you purchase a boneless leg of lamb it generally comes in an elastic net. While you could cook the lamb in that net, you wont be able to get the seasonings in every nook and cranny with it on so I recommend taking it off and then tying it back up with your own butchers twine or even regular string. What does it mean to butterfly the lamb? Imagine a butterfly within its cocoon. The meat is all in one solid piece. Then imagine the butterfly opening up completely. You are going to open the meat up to that it is spread as wide as it can go. In the instance of the boneless leg of lamb open it as wide as it can go and then if there are some thick areas make a small cut to open it like a book. Once you have the lamb leg at an even thickness you are going to want to season it heavily. Lamb is a mild tender meat and doesn’t require a lot of seasonings. In this recipe I use mustard, salt, pepper and some tarragon. Feel free to substitute other herbs such as oregano, poultry seasoning or a simple seasoning salt. You’ll slather the mustard and seasoning over all sides of the lamb. 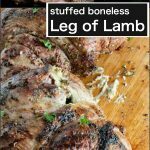 To make the leg of lamb recipe a little more special for entertaining it’s stuffed with an herb infused goat cheese. It makes it super impressive when you carve it and serve it on the plate. How to stuff the boneless lamb? Using butchers twine or string tie up the lamb log so it is even in thickness for even cooking. How to grill Leg of Lamb for juicy, tender lamb? Now that you have the boneless leg of lamb ready to cook its time to fire up the grill. Start by placing the lamb on a high temp grill. Sear the edges for 4 mins for each side. After searing all sides, move the lamb off heat (indirect) heat to finish it. I recommend cooking the lamb on indirect heat so you can get a juicy, tender flavorful lamb. When you are cooking it on indirect heat you’ll want to keep the lid closed as much as possible to maintain the heat inside of the grill. Only open it to check the temperature. How long to cook butterflied and tied lamb on the grill? You’ll need a thermometer to be able to see how long to cook the lamb. I wish I could give you a definitive time but it really varies on the size of the lamb and the thickness of the entire lamb. I made a 5 pound stuffed leg of lamb without a bone and it took about 20 minutes to cook to rare after searing the edges. I personally find going beyond medium difficult with lamb, it really starts to dry out. If you have guest that prefer medium well you can serve them pieces closer to the edges which tend to cook a little more done. Can I use a charcoal grill to cook the lamb leg? You absolutely can cook the leg of lamb on a charcoal grill. You will build the charcoal on only half of your grill then move the lamb over to the non heated side. If the coals are really hot you may want to leave the top off for some of the cooking and be mindful of final temperatures using the thermometer just like a gas grill. 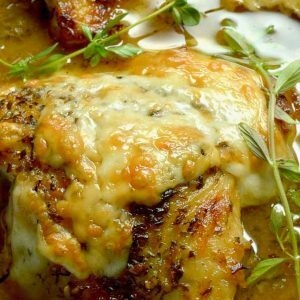 It’s winter but I want to make this recipe, can I make it in the oven? Yes, the lamb can be made in a 350° oven. Sear it in an oven proof pan on the stove top first, then place it in the oven. Id start with 20 minutes then use the thermometer to see how its doing then adjust the cooking until it hits your desired doneness. 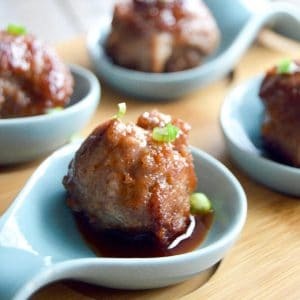 Can I use a slow cooker for this recipe? I wouldn’t make this in a slow cooker. The leg of lamb is a tender juicy cut of meat and placing it in a slow cooker is kind of wasting the extra expense for the more tender meat. You could do a lamb shank in a slow cooker instead, that meat is much more conducive to slow cooker cooking. My guests HATE goat cheese, can I use something else? Of course you can use a different cheese for the cheese spread in this stuffed lamb recipe. I suggest using a simple cream cheese, the block kind not the whipped instead. It will be a tangy creamy cheese that works really well in here. How much lamb for each person should I buy? I figure 1/2 pound of lamb per person when planning my menus. It sounds like a lot but between shrinkage in cooking and trimming away some of the fat it works out just about right. Can I freeze lamb if I made too much? Yes you can absolutely freeze any leftovers. As with all meat proteins they freeze better in larger portions so if you have a lot leftover you want to leave it whole and not sliced up. Wrap it in plastic and place in a sealed container in the freezer. When you are ready to serve it defrost completely, then warm it whole on a low temp oven until warmed before slicing. What side dishes can I serve with leg of lamb that do it justice? 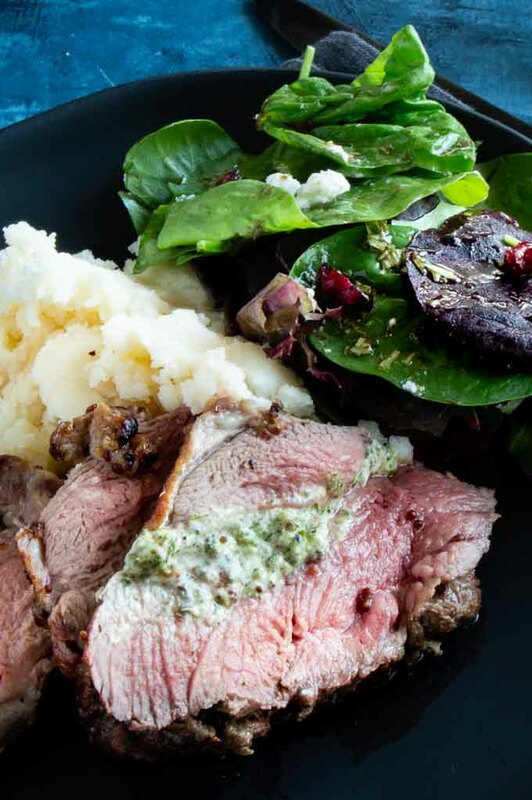 The lamb recipe is so wonderful you dont have to go crazy, let the leg of lamb be the star of the plate. Any of these easy recipes will work wonderfully. Scalloped Potatoes, Healthy Creamed Cauliflower, Sautéed Peas and Prosciutto or a really gourmet side dish this Mushroom Bread Pudding. What occasions can I serve lamb for … Leg of Lamb seems really really fancy and gourmet? Lamb is a perennial Easter Favorite recipe, but it also works for New Years Eve Dinner, Christmas Dinner or even an alternative to turkey for thanksgiving dinner. 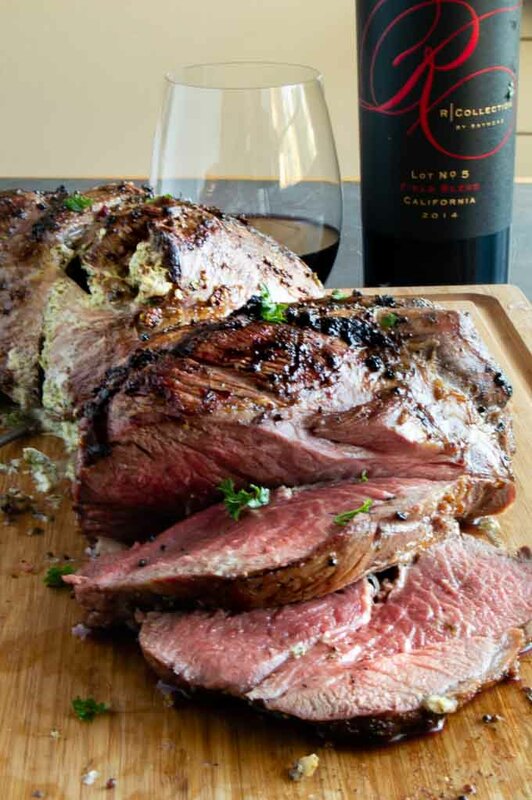 It’s quite reasonable in price and so easy to make though so dont hold this recipe for Leg of lamb for special occasions, serve it for having good friends over for a nice evening! In a small bowl, mix all the ingredients for the goat cheese spread: goat cheese, 1/4 cup parsley and garlic. Mix to combine and set aside. Remove the lamb from elastic netting, discard netting. Rinse and pat dry. Butterfly lamb by cutting small pieces like a book to open up so it is one even flat piece. If there is one area that is a little thicker you can place a piece of plastic on top and pound it thinner so it is all even. In a small bowl combine mustard, salt, pepper, 1 tsp parsley, and tarragon and combine will. Generously season the butterflied lamb by slathering on the mustard mixture all over all sides of the lamb. On the inner side of the lamb (the less pretty one) along one of the long sides spread a 2 Inch strip of the goat cheese spread. Carefully take the side with the goat cheese on it and roll it into a long log shape. Using butchers twine or regular string tie the lamb log at about 2inch intervals making sure that the log is the same width from one end to the other for even cooking. Preheat grill to high. Once hot, sear all sides about 4 minutes each so they have good grill color. Turn off the side burner and place leg of lamb on the side with no flame. You will continue to cook using indirect heat/ closed lid until the lamb reached 130° for medium rare. (Or whatever desired temperature you desire. See notes for classifications. ). I cooked a 5 pound boneless leg of lamb and it took about 25 minutes. The actual time will depend on the heat of your grill and thickness of the lamb piece. Use a thermometer. Once its at your desired temperature remove from the grill (turn grill off) and allow the lamb to rest for at least 15 minutes. Cut off ties then carve to about 2" thick slices for serving. Lamb and goat’s cheese sounds wonderful. I tend to pair with feta so would love to try this . I have to admit, I’ve never made leg of lamb because it scares me. LOL! This no-fail recipe is right up my alley. I hope mine comes out as gorgeous as yours. Looks scrumptious! Every Christmas, it’s a tradition that someone brings main meat dish beyond turkey or ham. I get so excited to what everyone comes up with. I haven’t had lamb in at least a year but this is perfect for our holiday party this year! I haven’t had leg of lamb in a while. That’s going to change real soon because this looks delicious. Oh my, you cooked this one to perfection! We love lamb and were planning to make a lamb roast when we have the in-laws over next week. I will go for your recipe, as it’s so detailed! I am always grateful for all info I can get when it comes to big cuts of meat! This is perfectly cooked lamb and such a great guide for anyone unsure about cooking lamb. Great post! We don’t eat a ton of lamb, but we definitely enjoy it when we do. This boneless roast looks so juicy and delicious! Its perfect for the upcoming holidays. Sometimes it’s nice to have an option besides turkey! Lamb is one of my favorite meat. It’s so flavorful and so healthy. I don’t cook it often because my hubby is not much of a fan but I’m going to make him this version. I love the addition of mustard and goat cheese spread. I bet he will like that! It looks absolutely mouth watering and delicious! I love stuffed pork and stuffed chicken but I never tried stuffed lamb before. I need to make this recipe soon! I am absolutely obsessed with lamb! lamb is really popular in Australia so we used to eat it a lot! I’ve only just recently discovered a local grocery store here that stocks the lamb I like! 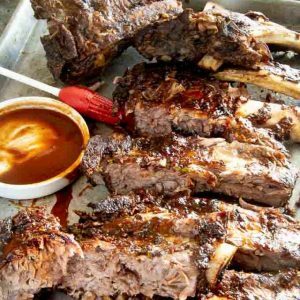 This recipe looks amazing, brings back so many happy memories of summer time barbecues with the family cooking up a leg of lamb! I’ve never stuffed a leg of lamb before, but that goat cheese and herb mixture looks really tasty! This would be a really nice special occasion dish for Christmas this year! I’ve never tried making lamb myself but now I have to! What a great meal! You have sold me on lamb. It was never on our menu, and now, with your fantastic lamb recipes, we are hooked! This is absolutely a fabulous recipe. You are right, anyone will look like a kitchen expert when serving this. Thank you for all the tips about cooking lamb. Such great info! What a special meal! For some reason I’ve been intimidated to cook lamb, so never have. It looks so easy after reading about your tips. I can do this! This recipe looks really easy to make. Its so perfect for the whole family. Definitely keeping for big gatherings and holidays ! It will be great to have a new recipe to try for company, especially during the holiday season. Thanks for this. This is a gorgeous lamb recipe and you make it sound and looks very easy to make. I love lamb but have never tried making it; thanks for the nudge. It looks wonderful.